 - red footnotes indicate a heads-up for parents and teachers about the title. We cannot foresee every incident that might potentially be an issue to everyone, but we have red-flagged those that are commonly a concern. 12. The Birth of Britain is Volume 1 of Winston Churchill's four volume set, "A History of the English Speaking Peoples." The next three volumes will be used in later years. Don't get the one edited by Henry Steele Commager, as it's abridged. For planning purposes, there is a Table of Contents with dates for all 4 volumes of A History of the English Speaking Peoples, and a schedule to break down the week's chapter into 4 short daily readings. 20. Saints and Heroes is church history. 24. Ourselves: approximately 22 pages per term. 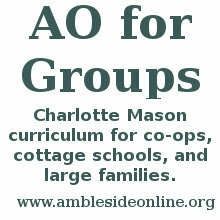 This book will continue through all the remaining years of the AO curriculum. This is the 4th volume of Mason's 6 Volume Series. Pages 1-65 of Book 1 are scheduled this year. Also available in a modern English paraphrase that can be read online or purchased. (K) The paraphrase of Book I, Self-Knowledge, the first half of Volume 4, can be purchased as a separate paperback book, with this caveat: Sometimes it's necessary to use a paraphrase - everybody has to start somewhere and a brand new student might feel like they're dealing with a foreign language and need to ease up on one or two books - but consistently relying on paraphrases won't do your student any favors. 26. Charlotte Mason had students at this level read the daily news and keep a calendar of events. We suggest students choose the most important 2 or 3 stories of the week and re-write them in their own words as a chronicle of the year, making the heading of each page something like "This Week in History, September 1st, 2003." Teachers: pre-read and filter current events materials (on the web, or in print) as necessary, due to the potential for coverage and topics of an explicit nature, even from conservative sources. We've listed some possible options here. 34. Beowulf: AO recommends the edition of Seamus Heaney's translation with graphics that illuminate the setting and objects mentioned in the text. The page numbers in the 36-week schedule are from this book. ($); there's a cheaper edition of Seamus Heaney without illustrations. ($) Another favorite: an updated verse translation by Frederick Rebsamen ($ K); the version by Burton Raffel is also very accessible ($ K), or use this free-verse version with our usual caveat: using easier versions of hard books won't help your student build the skills and confidence to tackle challenging content in the future. The best way to learn to read hard books is to read hard books. Go slow, unravel sentence by sentence if you have to, refer to a summary to check yourself (or to get over an especially difficult hump). Sometimes an easier version is necessary, but keep in mind the long range goal: to be able to handle the original with confidence. Another (not easy) option: Online Translation by Francis B. Gummere. Most versions have 43 parts; that also appears in the 36-week schedule. Pt 24: pg 111-119? line 1651-1757? 36. The Oxford Book of English Verse, 1919, edited by Arthur Quiller-Couch, is a poetry anthology Charlotte Mason used; it's very good, and it's online in a searchable format. (Poems 1-24, 29, 31-33) The same text, but with a different title, is also at Project Gutenberg β The best way to tackle these is to have your student rewrite them in their own words. There are some tips for reading Middle English here. As a parent/teacher resource, this site offers modern translations of the assigned poems. Click the first line, then click the word "translation" at the top. AO offers some rough and general modern translations here, but be aware that allowing your student to use paraphrases as a crutch will not help him acclimate to Middle English. We suggest the parent/teacher use the paraphrases only to help the student through the material. Check online sites such as Librivox for free audio readings of poems. 40. Easy Grammar Plus: It is not necessary to memorize the prepositions at the start, just write a list of them and explain an easy way to remember most of them, such as "any way a worm can go in relations to two apples," or "any way a swallow can go in relation to two mountains." A parent using this with one child could get by with only the Teacher's Edition since the student workbook is included in it, but multiple students would need their own workbooks. There are about 330 student worksheets in this thick book; expect to do one sheet every day to get through the book in two years. (Purchase from their website or CBD) Easy Grammar Grade 8 Student 180 Daily Teaching Lessons by Wanda Phillips is just as good; it also has the student workbook included in the teacher's edition. Work through Easy Grammar Plus over two years. Students who are moving up to Form 4 and only have a single year in Form will need to work through it quicker. Relativity and Quantum Mechanics: Principles of Modern Physics ($); see help in corresponding the books here. These books have been republished by Living Book Press and and can be ordered individually directly from their website. They may also in print through Lerner Publishing Group at Book Depository. Some of the American references may have been converted to British references. The book goes in and out of print and can sometimes be difficult to find, although it does pop up; public libraries would be the obvious first place to look since the book isn't really that old. Please don't feel that the Advisory is asking anyone to go on a major quest for the only excellent book out there. That's not what was intended by leaving the book on the list, only that if you CAN get a copy, it's still our first choice for this year. If you are unable to access it, another solid option is The Boy Scientist by John Bryan Lewellen, out of print, but more readily available at used book sources than Secrets of the Universe (not the recent "The Boy Scientist: 160 Extraordinary Experiments and Adventures;" look for the 1955 one by John Llewellen). Another option is The Sciences by Edward Holden, out of print, but online. Charlotte Mason herself recommended Holden's book, so even simply taking a look at it will give an idea of the kind of science text she would have used. We don't usually recommend out of print books, or very expensive books. All of these books are good, and if you can obtain them, we suggest you use them. However, we continue to seek an alternative that fits our guidelines of excellence, availability, and affordability. 48. Signs and Seasons - read Prologue and Chapter 1 this year, including note on how to use properly. Both the book and journal are cheaper from CBD. Field work is an integral part of this book. When The King Enjoys His Own Again, Farewell to Lochaber, Battle of Otterburn, or any other tunes of your choice from this website. Again, work on each song about 4 weeks, reviewing as desired. The idea is to enjoy them, not turn them into drudgery.